Time tested strength and durability! Providing long-term reliability and proven biocompatibility, cast gold restorations are an excellent choice for posterior restorations. EDL's skilled technicians will provide you with restorations that meet your patient’s needs and your highest standards. Your patience will enjoy a beautiful, durable restoration. 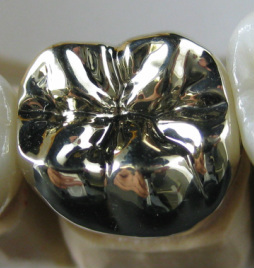 Although commonly used for out-of-sight molars where esthetics are less of a concern, cast gold is also a great material for inlays and onlays. EDL will scan your models and CAD design your restoration, followed by precision DLP printing of the final wax up for casting. Use your preferred margin preparation. Minimum space requirements are .8mm axel wall reduction with 1.3mm for occlusal anatomy.